Carol Robinson’s Billows generates a seductively gentle ambience, apparently effortless but carefully constructed by means of a sustained rigour. It is warmly sensuous but deeply cool. C’est peut-être cela, cette matérialité de la musique, sa capacité à prendre possession de nos sens, qui est le plus émouvant dans les compositions de Carol Robinson. After having listened to combinations of frequencies that instantly make sense, connecting with a different order of priorities without apparently altering what was already working, the urge of telling about the experience to someone who can understand becomes stronger. Such is the case of Billows, the debut CD as a composer of clarinettist Carol Robinson, until now principally present in this reviewer’s memory as a regular performer of Phill Niblock’s scores. Let’s be perfectly clear from the start: this album is an instant addition to the “get-a-copy-soon” list, in the hope that it is just the beginning of a path that looks pre-established, with a definite aim. Robinson is deeply linked with the conceptions of Giacinto Scelsi, who offered a veritable authentication of her thinking of music (“an opening toward something beyond our reality”). However, among the influences declared by this Paris-based American artist, the winds of South Dakota – where she lived as a young girl – represent the most important. Indeed Billows resonates splendidly exactly for its correspondence to the “composite minimalism” of this natural phenomenon. Gently intertwining, caressing breezes on the skin while standing in contemplation under a warm sun, no urban or human presence, only the listener and the cosmos at large. This is what a sensitive subject will probably wish when inhaling this music, possibly alone, in full quietness. Entirely linear or slightly gliding, these overtone-fuelled whispers are thoroughly marvellous, an important message to the people who keep blathering around “vibration”, absolutely unaware of the word’s actual implications. In technical terms – which almost equals swearing, given the purity of the resulting sounds – Robinson utilized exclusively clarinets (precisely, basset horn or birbyne) smoothly enhanced by a Max/MSP live electronic system. The outcome’s unpretentiousness teaches a lesson to those musicians who allow the computer to do everything, thus killing the potential spiritual traits of a work. Despite the absence of immediately recognizable clarinet pitches – except perhaps for the initial part of “The Lingering”, where the instrument’s real voice is clearly audible – the sonic occurrences are acknowledged as innate, akin to something we were raised to – and still necessary. One couldn’t really match this up to the aforementioned Niblock, or Alvin Lucier, in spite of the typical adjacent-tone quivering produced by some of these pieces. Robinson’s approach is not that manifest: it’s less physical, seemingly informed by meditation and reminiscence and, in that logic, maybe closer to the essence of Eliane Radigue’s concentrated transcendence. This, ultimately, renders the whole effective in an utterly new way. And this, too, is what we call an individual style, not the least because the tracks are very short in comparison to the lengthy distances privileged by the others. Also, that this woman has waited so long for deciding to release her own material is testimony to a rare wisdom. Either via speakers (recommended – and in “repeat” mode, of course) or headphones, the influence of Billows on my psychophysical organization has been incredible in barely three days of listening. The importance of this kind of event in a receptive person’s life can’t be stressed enough. Near silence, and even further. It is all extraordinarily beautiful, an inherent gratitude perceived as the heartbeat frequency decreases. […]Partie de la musique improvisée et du traitement électronique, elle fait mouche avec son nouvel album Billows, où le souffle de l’instrument, tamisé et transformé, devient une onde fantasmagorique qui murmure autant qu’elle emporte. Sobrement extraordinaire. […] Robinson’s instruments – the birbyne, by the way, is a Lithuanian single or double reed instrument – are miked up and the signal routed into the computer, which adds voices of its own, whose pitches and intervals depend not only on those played live but also on the timbre of the instrument and the acoustic of the performance space itself. Such a bald description can hardly prepare you for the outstanding beauty and subtlety of the music contained in these twelve tracks (which Robinson recommends should be played in shuffle mode) – the accompanying booklet, with its references both to the South Dakota landscape Robinson grew up in and Milan Kundera’s Slowness, might give you more of an idea of what to expect (“to relish, prolong and remember a moment, one moves and acts slowly”), but you won’t want to read it while listening. Robinson’s technical mastery – documented on numerous discs: check out her Feldman and Scelsi on Mode, while we wait for Radigue’s Naldjorlak II and III – is evident throughout, but that doesn’t explain why the hairs stand up. Of course, you never know why the hairs stand up – but if they do you know you’re onto a winner. And this is one for sure: an essential release. […] Cet élégiaque Billows est une ode à la lenteur, une apologie de la variation subtile en douze courtes pièces. S’il fallait donner une image, ce serait un ciel dont la lumière change imperceptiblement au crépuscule, ou peut-être une vague qui, inlassablement, caresse la grève, reflue, revient mais n’est jamais la même. Pour cet enregistrement en solo, Carol Robinson a choisi d’utiliser un cor de basset, ancêtre de la clarinette basse dont Mozart fut en son temps le laudateur notoire. Elle y joue également de la birbyne, autre instrument oublié à anche simple. De ces ancestrales clarinettes bardées de capteurs, elle tire des souffles vaporeux, de longues notes répétées. Le traitement électronique, d’un raffinement extrême, apporte une puissance d’évocation onirique, une douceur palpable. Les compositions procèdent par superpositions et chevauchements, ondulations, créations d’harmoniques, modifications de timbres. Le temps y semble étiré jusqu’à l’effacement de tout motif mélodique et rythmique. Ce disque est l’occasion de rendre hommage à l’ambitieuse et salutaire politique artistique du label parisien PLUSH qui, depuis le début des années 2000, redéfinit les frontières d’un jazz suave, brillamment trempé d’électronique. On laissera à Carol Robinson le mot de la fin, emprunté aux notes de pochette : « La musique est une ouverture vers quelque chose au-delà de notre réalité. Toucher aux frontières, atteindre ce que l’on ne comprend pas exactement, ce que l’on ne codifie pas clairement, tel est mon objectif avec la musique improvisée électronique. » Elle touche magistralement au but. Electro-Acoustic music has come a long way since Iannis Xenakis first rolled Diamorphoses out of the ORTF studio in Paris back in 1957. What took Xenakis months of work to achieve can now be done — even surpassed — with digital gear to the extent that such music can be made live right now, while you’re sitting there. 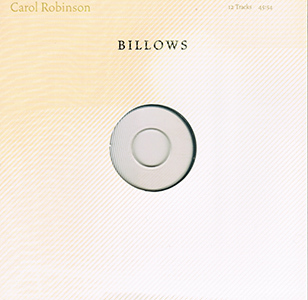 In her album Billows, clarinetist and composer Carol Robinson creates a continuous 45 minutes long vision of soft tones, slowly growing out of nowhere and returning to the void, sometimes combining in harmonious union and at other times pulsating in a kind of dreamy harmonic conflict. This disc is nothing if not atmospheric; it is almost like as if you could build an Aeolian Harp out of free reeds, and while you can tell that there is breath in the sounds that Robinson is generating you would never guess that a clarinet is used as the trigger. When Otto Luening began his interest in generating “pure” electronic sound in the 1950s he favored the flute as he reasoned that its tone is closest to a sine wave. By comparison, Robinson’s clarinet in Billows produces tone that seems purer than the breathier, sharper attack of the flute and by exploiting the mellow sound of the chalumeau register she is able to generate deep tones well out of the flute’s range. Billows would be a great disc to meditate to, or as a background to chill out in a general sense, moreover it’s a very fine example of minimalist electronics worthy of favorable comparison to Brian Eno’s “2/2” on the album Music for Airports. […] This disc is quite unusual. It consists of 11 pieces performed by the composer (she’s a leading exponent of new music for clarinet). Her own taste tends to draw her to music with qualities of deep concentration, sustained attention to the subtleties of sound’s development over time, and a respect for aural sensuality. I’ve heard these proclivities in her work as a performer in a recording she did of Morton Feldman clarinet works on Mode 119 (reviewed in Fanfare 27:1). As a composer, Robinson tends toward a similar aesthetic. She knew Giacinto Scelsi and collaborated with him, and a belief in the importance of “micro-inflection” of sound seems to have emerged from the encounter. All the pieces on this program are superficially similar. Robinson tends to produce long tones that are then recorded in real time into a MaxMSP patch (a computer program that does live sound processing). The result is an ambience of transposed, quivering, slowly morphing tones. Over time, one begins to hear distinct differences of pitch, register, and process from one piece to another, but these still are subtle. The effect is soothing, hypnotic, and if one listens closely, one starts to move into a paradoxical blend of close attention and relaxed meditation. Some may ask where’s the art in all this? Well, in collaboration with her programmer Carl Faia, Robinson shows she has a distinct vision of a sound-world she wants to explore, and into which she’d like us to enter. I’d also respond that her creating such pure long-held tones (needed as the foundation of these computer-generated environments) is a significant performative act. (To take one example from another tradition, if one studies the Japanese shakuhachi flute, long tones are regarded as the basis of the practice, even though “real” pieces are all over the map in their technique). The composer seems to be playing different types of clarinets, and the back cover also mentions basset horn and birbyné (a Lithuanian instrument). It’s basically impossible to tell what’s what from listening without further information, and it’s probably not that important for savoring the final result. Many performer-composers tend to create music that is about other pieces they’ve liked, or that creates an eclectic gamut of ingratiating musical fragments. Robinson is much more focused in her practice, and the result is satisfying, in that it accomplishes what she sets out to do. Worth some deep listening.